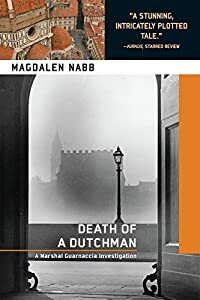 Death of a Dutchman by Magdalen Nabb, a Mysterious Review. Review: The late Madgalen Nabb's Marshal Guarnaccia mysteries are being reissued by Soho Crime. The second in the series, Death of a Dutchman, was originally published in 1983. The Marshal is visiting an old woman as part of his rounds, patiently listening to her stories, when she remarks that she has heard noises from an adjoining apartment, one presumed vacant. Upon knocking at the door, he hears water running, breaks in and discovers the tenant, a jeweler from The Netherlands, near death. Although help is summoned immediately, the man dies, but not before uttering "It wasn't her." Though the officials in the case are convinced the cause of death to be a suicide, The Marshal isn't sure and conducts a quiet, but urgent, investigation to determine who might have wanted to kill him before his superiors close the book on the case. Though Death of a Dutchman was written before computers and cell phones and when travel between countries in Europe was far more complicated than it is today, it bears the timeless quality of a good police procedural in which everything one needs to know is determined by asking pertinent questions and listening to what people say. The Marshal suspects something is awry here, and uses gentle persuasion with the young Lieutenant responsible for the investigation to get permission to continue to work on it. The relationships that the Marshal has with his co-workers, his family, and the people in his neighborhood, are quite endearing. When one of the men in his station is inadvertently killed, the Marshal is devastated. The personal approach he takes to everyone and everything is one of the aspects of the book that make it so special. The case is reasonably complicated and somewhat dependent on idiosyncrasies of Italian law that may be unfamiliar to non-Italians, but that doesn't lessen the appeal of how Marshal Guarnaccia goes about piecing together the life of the Dutchman and the reasons someone may have wanted him dead. The conclusion, whether or not the one person the Marshal suspects of the crime gets away before the official paperwork is sealed, is really quite thrilling. Soho Crime is to be commended for reissuing and promoting the early books in this series. They deserve a new audience of readers. Acknowledgment: Soho Crime provided a copy of Death of a Dutchman for this review.